Developer: Square Enix Co., Ltd., Tose Co.,Ltd. 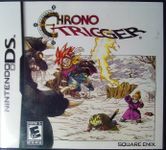 One of Square's most famous role playing games for the Super Famicon, Chrono Trigger features character design by Akira Toriyama of Dragon Ball fame and music by Yasunori Mitsuda. It is by many considered to be the best RPG for the Super Nintendo. The battle scenes in Chrono Trigger were special in the way that each character had an individual timer on when they could act, and one character could wait for another to be ready and form a combination special attack. The game was subsequently ported to the Playstation by TOSE and into a remake on the Nintendo DS. A grande story bridging over dimensions. Travel through time, to a far distant future. Fearful events and unexpected people are awaiting you there. A new style command-type battle system. All combats take place on the same screen, in real time. With several command types, the battles are tactical. A fresh presentation of Akira Toriyama's world. Detailed graphics, using all 32 megabits. You will enjoy an adventure in a true Akira Toriyama world.